One of my resolutions this year is to get back in shape by making healthier food choices and engaging in regular physical activity. Admittedly, exercising has taken a backseat after I've given birth to my second baby. My default excuse was that I'm breastfeeding and I don't have the time. But now that my baby is more than 1 year old, I decided to prioritize my own health and well-being. Since late January, I've been regularly hitting the gym doing circuit training and boxing. While my weight loss has not been as fast as I would want it to be (age being the culprit as it slows down our metabolism), I'm starting to fit in some of my pre-pregnancy clothes. Weeee! My husband and I have always been physically active in our younger years. Well, as you know things change once kids come in. But we both still like to continue the active lifestyle we used to have even if family life sometimes makes that quite challenging. Living an active lifestyle is not only beneficial for us. It is also an important habit to teach and pass on to our kids. 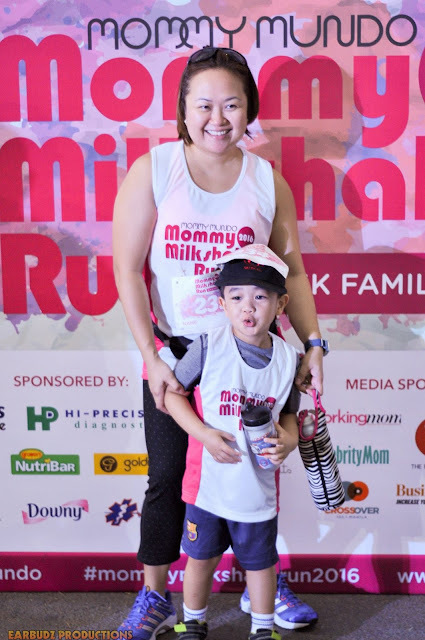 When I learned about the 6th Mommy Mundo Milkshake Run at the Bonifacio Global City on March 6, 2016, I didn't hesitate to sign up at once. We registered as a whole family but my husband came home sick from a business trip in Thailand a day before the event. We decided that only me and my 4-year old son, Caleb would go. I was so excited because this was our first run together as mom and son. I prepped our stuff in advance and hit the sack early the night before the event so we could make it to the 5:30 AM registration. On the day of the event, moms, dads and kids of different ages flocked 9th corner 34th street in BGC even before sunrise. Many parents came with their kids' strollers and some mommies wore their babies on slings! There were booths from the sponsors and stalls for food and refreshment. A tent served as a diaper-changing and breastfeeding station. How convenient is that? Breastfeeding station for nursing moms like me. Beats NAIA 1... LOL! Before the start of the run, a fitness instructor from Curves led the warm up and stretching. Afterwards, the participants of the 5K run headed off 10 minutes earlier than the 3K run participants. Majority joined the 3K and it gave thrilled my son to see so many kids and their parents at the starting line. As soon as the 3K started, Caleb immediately dashed off and I had to catch up with him because he might get lost in the crowd. I think he thought it was a race. Lol! After 1 Kilometer, he was already complaining that his legs are starting to hurt. Good thing they had a couple of water/hydration stations by Waters Philippines and Gatorade. We kept a steady pace all throughout the route and what do you know! We made it to the finish line! I was so proud of my son! Proud moment! We made it! Guess where my tired finisher headed first? He was super thirsty! The fun didn't stop at the run. No matter how tired my son was, he still had the energy to try out the toy pony ride at the Fun Ranch booth. Moms checked out the fitness assessment/consultation at the Curves' booth. Participants were given a loot bag of healthy products at the end of the event. My favorite was the lactation cookies and brownies from Mommy Treats and Dona Maria Jasponica Brown Rice. Thank you Mommy Mundo! We had an awesome and unforgettable mom and son quality time at Mommy Milkshake Run 2016. This experienced inspired my son and he even urged me that we run again in BGC. Wow! So to this, I say, "Mission Accomplished!" We look forward to joining again next year and we hope that we'll be complete as a family by then. One of the things I love about being a SAHM is being able to do fun activities with my kids any time of the day. For our merienda, I decided to make an easy Maya Oven Toaster Banana Cake with my 3-year old, Caleb. He's into fast food/Play-doh Ice cream lately so he got really excited when I told him we're going to bake his favorite Banana Cake together. Because I love nuts, I added half a cup of almonds slivers. Walnuts would have been better but we only had almonds in the pantry. Caleb identified the ingredients like he was on a cooking show. He also learned about some basic baking utensils like the measuring cup, measuring spoon, wire whisk and baking pan. By the way we only used 1 egg for the cake. Any good chef should have excellent knife skills. I showed him how to slice the first banana and look at how he sliced the second banana almost perfectly. He's now promoted from using the plastic knife to the dinner knife. This is a big step for my junior master chef! The recipe is very easy, a three- year old can do it without any fuss - just mix all the ingredients together. Actually, you don't need a whisk to put them all together, but of course I won't disappoint his fascination to the whisk. Our finished product after 30 minutes. It's never too early to involve our kids in the kitchen. When Caleb was younger, he would just observe and help put ingredients in the utility bowls. I feel proud that he can now slice the bananas and mix without making so much mess. Easy banana cake today, chocolate souffle tomorrow. Who knows!